Sometimes, when you’re working in Windows How to Delete Your Microsoft Account & Create a Local Windows 10 Login How to Delete Your Microsoft Account & Create a Local Windows 10 Login Have privacy concerns about using a Microsoft Account in the cloud? Here's how to create a local Windows 10 login account instead. Read More , weird stuff happens. For example, a new feature might be added with the intention of making your computer sound better 8 Calming Chrome Tools for Relaxing Music & Sounds 8 Calming Chrome Tools for Relaxing Music & Sounds Now that the holidays are over it is time to relax. So, sit back, unwind, and enjoy your browsing with these calming Chrome apps and extensions. Read More , but inexplicably, it makes it worse. 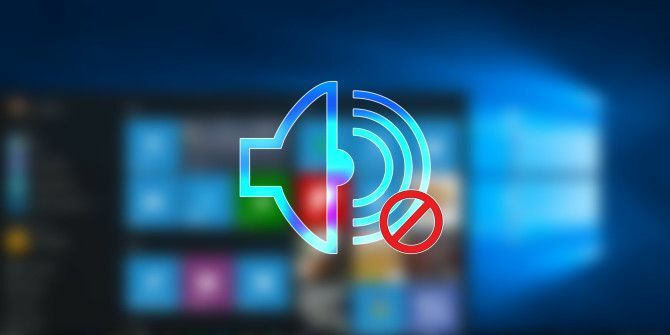 That is happening to many users with Audio Enhancements enabled in Windows 10. It’s meant to optimize the sound for each computer’s hardware, but in some cases, it’s actually making things worse. If you’re having problems with your sound, try disabling Audio Enhancements and see if it helps. Open the search box in your taskbar and type “Sound”. Click on the Sound Control Panel Why Microsoft Is Killing the Windows Control Panel Why Microsoft Is Killing the Windows Control Panel The Control Panel is being decommissioned. In Windows 10, the Settings app has adopted most of its features in a more stylish and mobile-friendly interface. Is that really necessary? Read More option. On the new box that pops open, make sure you’re on the Playback tab, right-click the default device (probably labeled Speakers), and click Properties. In the windows that opens, check the box labeled Disable all enhancements. If you have multiple playback devices that are having issues, repeat the steps above for each. Did this fix your computer’s audio issues? Any other ideas that might help Windows 10 audio problems? I have been having this problem for some time and the only remedy I got to work was restoring the computer to a time when sound was working. Hopefully one of these solutions will fix my problem, so I do not have to set a restore point every few days. Unfortunately, none of these suggestions worked for me. Windows shows audio as being played, but nothing comes out of the speakers. Also, there wasn't an option to "disable all enhancements" in my speaker properties. I fixed a sound issue with Windows 10 by disabling the Windows Audio service and then re-enabling it. Download Driver Talent. That's the only driver program that has the IDT High Definition Audio Codec (Beats Audio Control Panel) that came installed on Windows 7, 8 and 8.1. I'll have to try this on my Iconia W4-820. After the November update, I no longer have sound. Hopefully this will fix it. I installed Realtek HD Audio Codecs - this fixed my problem.